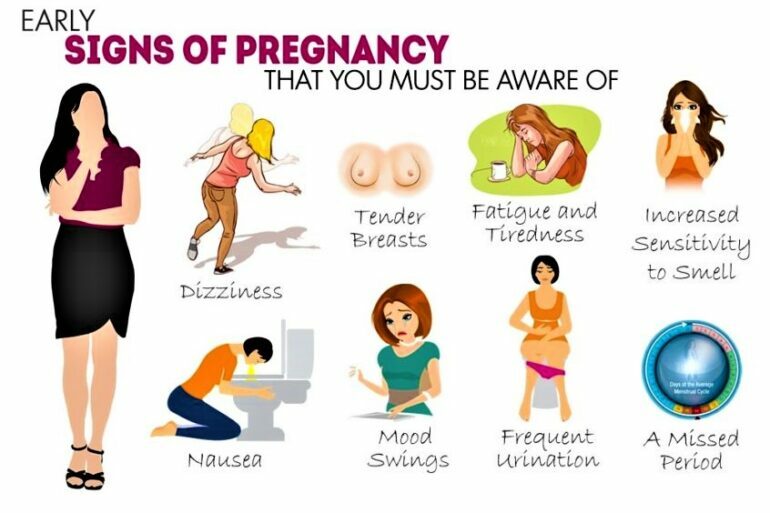 When you are not so sure about being pregnant and there is no time to take a home pregnancy test or a laboratory blood test to confirm it; there are some symptoms and signs which can indicate the presence of this condition in your life. Taking the stairs and you feel unusually tired could be taken as a sign of pregnancy. An activity which resulted easy to do previously is getting harder due to the need of oxygen requires by the fetus. This situation will get deeper as the baby grows in the womb and exerts pressure in the lungs and diaphragm. 2. Soreness in the Breast area. Breast size is certainly going to increase during pregnancy, so if you notice an augment in the mammary glands along with soreness, darkening of the areolas and presence of veins in the area, being pregnant is the possible reason for any of these signs. The increasing of hormones thanks to the pregnancy would cause the sensation of exhausting, a situation that recedes after the first trimester of gestation. One of the most common indicators of pregnancy is nausea. This sensation can be either presented early in the morning or at any time during the day and it starts around six weeks of gestation. This feeling would fade out during the second trimester; but in the interim, it is advisable to eat food which can calm the stomach from this sensation. An increasing sensation to go to the bathroom and urinate, especially during the night, is a clear sign of being pregnant. Due to the excessive production of body fluids, the bladder is forced to work harder translating this into frequent visits to the toilet to release those liquids. 6. Cramping or small bleeding. A small amount of vaginal bleeding spots can be shown during the beginning of gestation period; this is caused by the position of the inseminated egg to the uterus – taking placed during the first two weeks after fertilization. Besides, the presence of abdominal cramps similar to those of the period is existing at an early stage of pregnancy. 7. Aversion to certain food or cravings. During pregnancy, certain food can cause an aversion sensation or there would be the need of eating certain meals during the first months of pregnancy. These feelings are caused by the increment of hormonal changes that take place during gestation and they would increase as the gestation progresses. Other indicators of pregnancy at the early stage are the presence of headaches, constipation, mood swings and an augmentation in basal body temperature. But the clearest sign of gestating a new life is the missing of period. Once you missed the menstrual cycle at the time of the month is usually taking place – if it is regular and constant, the chances of being pregnant are at a high stake. The absence of the menstrual cycle can occur even without the presence of any of the signs mentioned above. It is advisable to take a pregnancy test two days after the absence of the period to confirm your state. If the result is negative, taking it a few days later to assure whether you are pregnant or not.